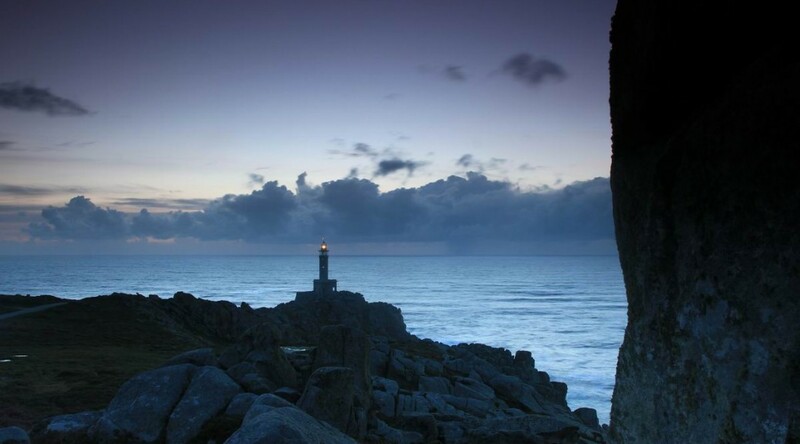 O Camiño dos Faros starts in the smallest lighthouse but not less important. The first stage in our route starts in the small light at the entrance of the port in Malpica to reach the beach Niñóns after walking 22 kilometers long, with loads of slopes. Along the route, there are 6 calm beaches with their bays, the SisargasIslands with their lighthouse, huge cliffs and Punta Nariga. Estimated time: 9:30 hours. This time includes the stops at every landmark. The first stage starts at the lighthouse in the port in Malpica and goes along this beautiful fishing village: the port, its streets, the promenade and the beach Area Maior to go on towards Saint Adrián. Before reaching the chapel, we walk by the beach Seaia and the fountains of the Romeros (people who take part in pilgrimage), where we can get some water. From Saint Adrian, we can enjoy an awesome view of Malpica and of the SisargasIslands. We will see these islands from the so-called path of the fishermen which leads us to Beo, walking through the first cliffs of this Camiño dos Faros. From Beo, that is a stop to have something to eat and drink, we go on with the route towards Seiruga, where we will have to take off our boots, to pull up our trousers till the knee to go through a river. Then, we will walk along the beach Seiruga and we will arrive at Brizo, where we will walk along the beach before going up through a stream towards Punta Nariga. When being up the stream, we have to take the dirty track on the right and a path which will lead us to the windpark that we will walk through. Then, we will walk down a path till we reach the road of Nariga and, from there to the lighthouse Punta Nariga, built by César Portela. There are both a complicate ascent and a downhill to the beach Niñóns walking by a cliff-lined area where you are told to finish the stage at that point.